Posted on January 20, 2016 by Michelle M.
We received a package the other day from Kelle, John and their flock. 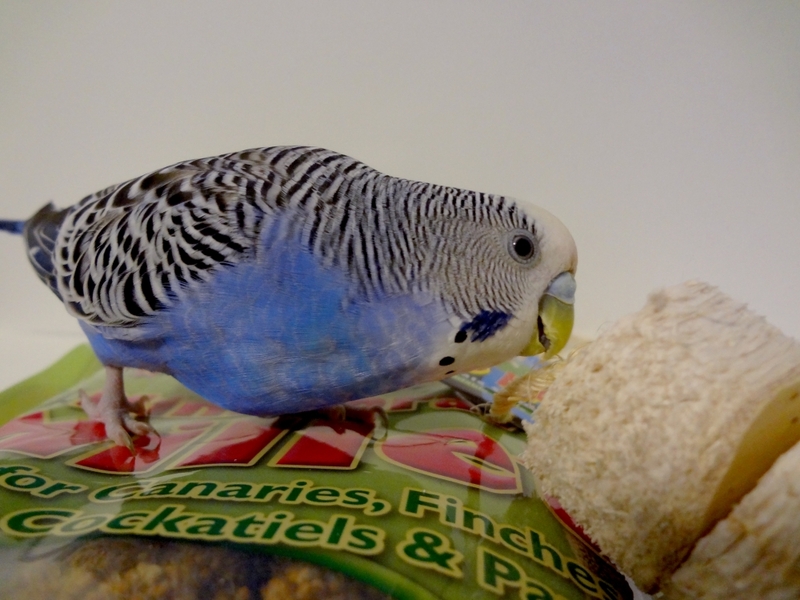 Inside were some of the budgies’ favorite things. Millet and marshmallows (what we call shreddable kabobs). 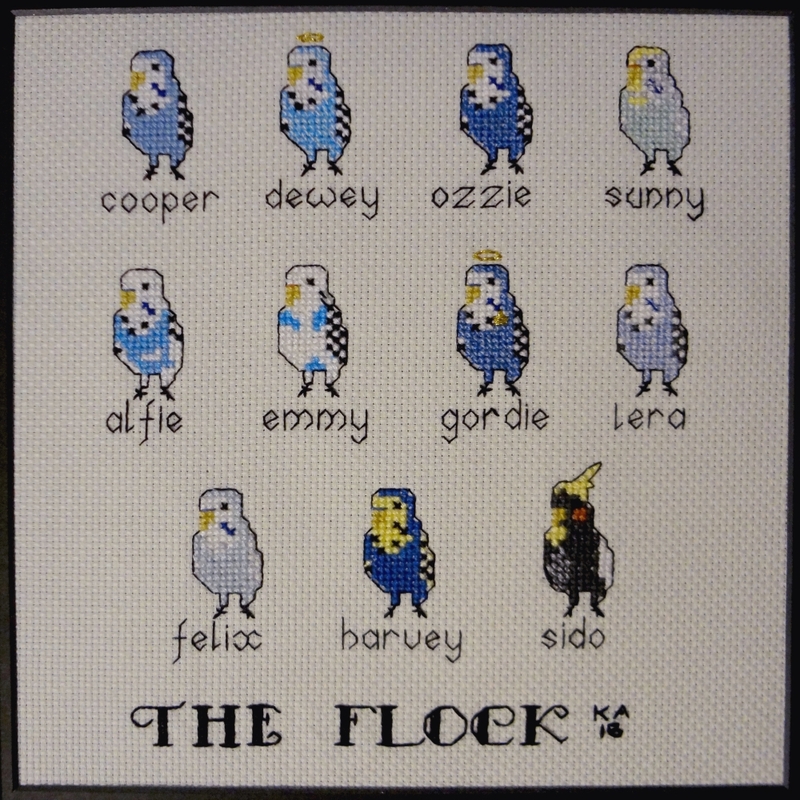 And an absolutely amazing framed cross stitch of the flock. I couldn’t believe it! It’s our flock (and in the order they joined the family). 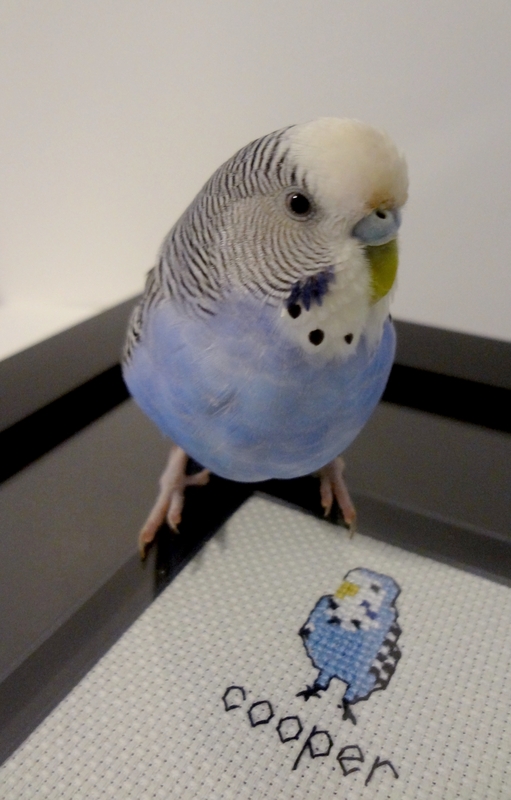 The detail is amazing (Emmy’s one white cheek, the spot-on colors). And I teared up when I saw the little halos on Dewey and Gordie – and Gordie’s gold star. I’m going to treasure this forever. A thousand thank yous for this amazing gift. Love to you and your flock! A new home for Spencer! Posted on March 10, 2015 by Michelle M.
When Gordie passed away we received a lovely comment from Kelle. 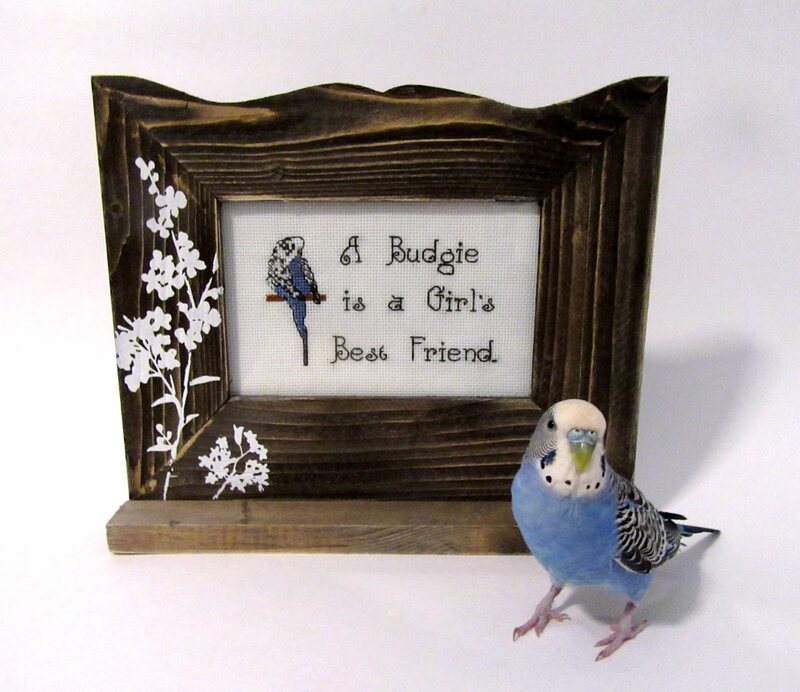 She wrote that she would be adopting an older budgie from a local rescue in Gordie’s honor. And she did! Meet Spencer (on the right, with Faust). Spencer moved into his new home around Thanksgiving. 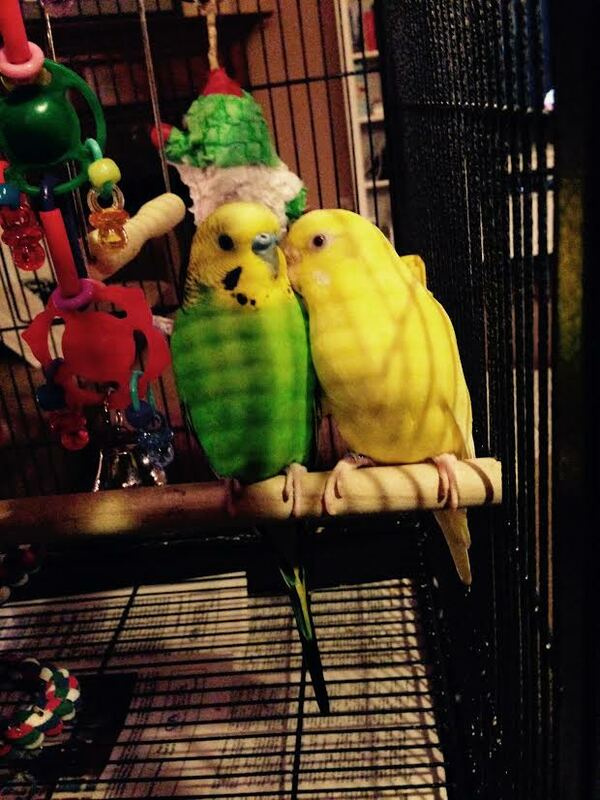 He is now all settled and adjusted with budgie siblings Faust, Hulk (below, left), Stephanie (below right) and humans Kelle and John. 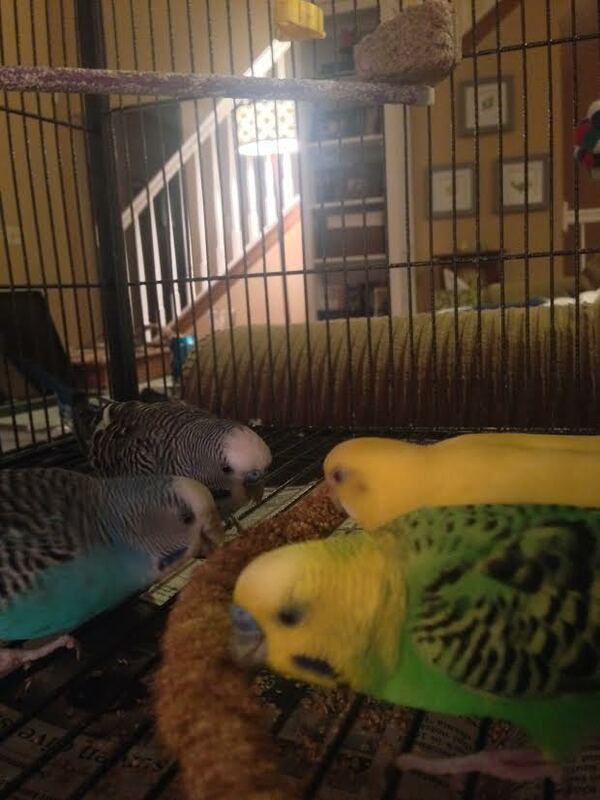 Here are the budgies enjoying their Valentine’s Day feast. How absolutely wonderful that Spencer has found a new family. Thanks to Kelle and John he now has his happily ever after. And what a wonderful tribute to Gordie, as well. 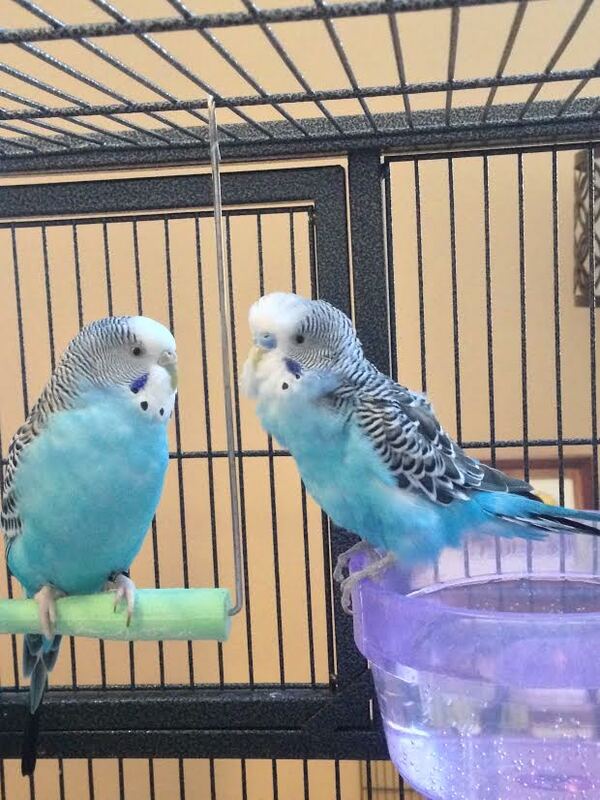 Hopefully, Spencer and Gordie will inspire another budgie adoption in the future!